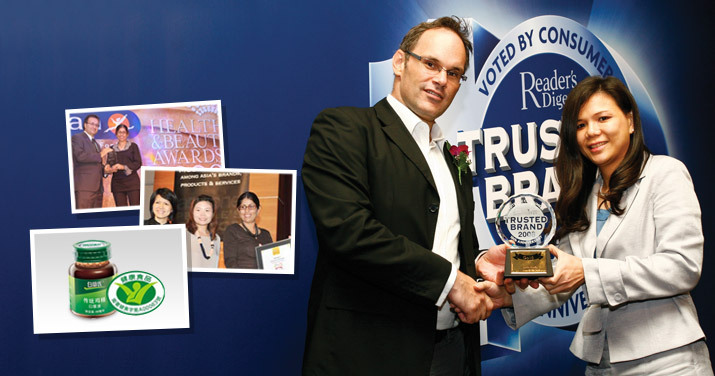 BRAND’S® is proud to announce that it has won the Asia Gold Award again in the Reader's Digest Trusted Brands Awards 2006 in the vitamins and health supplements category. “We are proud to have won the Reader's Digest Trusted Brands survey as it demonstrates that we are a trusted brand throughout Asia. Many health supplements companies have spent a great deal of money on advertising and promotion and may have achieved some product recognition – but BRAND’S® has gone much further in building a trusting relationship between our brand and our consumers. Over our 170 year history, we have established trust in the hearts of consumers in a diverse range of countries from Thailand to China.” Said Mr Eiji Koike, President & Chief Executive Officer, Cerebos Pacific Limited. “We also pride ourselves as the only health food supplements company in Asia that invests consistently and heavily in scientific research to investigate and to prove the efficacies of our products. We conform to international standards in quality and control, and we listen to and fulfill the needs of our consumers. We are a brand that constantly evolves to meet the changing health needs of consumers – adding to our positioning as a unique and caring healthcare company, and a trusted, well-loved household brand name.” Mr Koike added. The Reader’s Digest Trusted Brands event is an annual regional consumer survey and is now in it's 8th year. Consumer votes came from consumers from seven participating countries, namely; Hong Kong, Taiwan, Thailand, Singapore, Malaysia, Philippines and India. Votes were based on ratings such as trustworthiness, credible image, quality, value, understanding of customer needs and innovation.